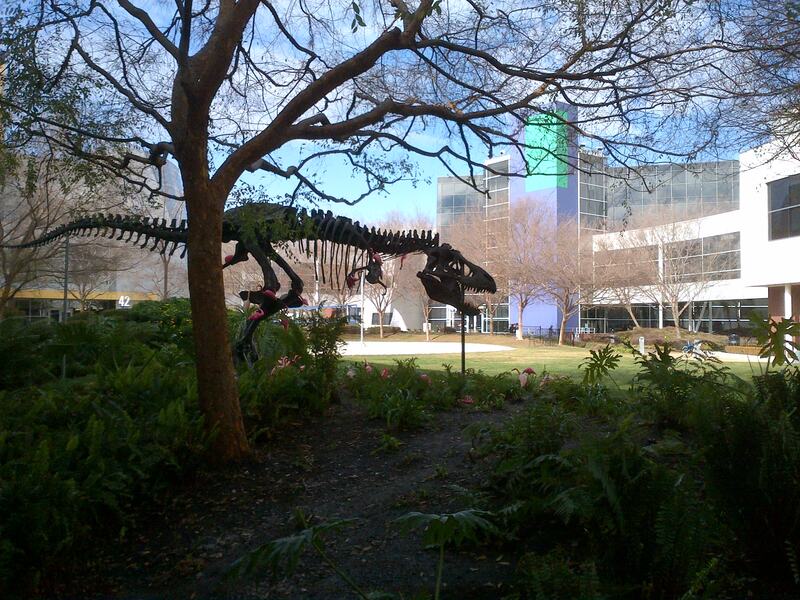 Google's pet T-Rex, Stan, is on the prowl at the Googleplex in Mountain View, CA. On February 10th, Jason visited the Googleplex in Mountain View, CA to talk about Chasing Aphrodite and to solicit help with a new initiative, WikiLoot. The talk was part of the Authors@Google program, and was organized by Jason’s old friend Steve Meaney, who works in marketing there. (Thanks, Steve!) Also attending were several people from the archaeology department at nearby Stanford University. The hour-long talk gives an overview of the role of the Getty Museum and other American museums in the illicit antiquities trade. At minute 49 the talk turns to WikiLoot, an effort to harness technology to expose the illicit trade. A Q&A follows. January 23, Washington DC: The Society for the Preservation of Greek Heritage, the American Friends of the Acropolis Museum and the lawfirm Steptoe and Johnson will host Jason for an evening lecture and book signing at Steptoe and Johnson in Washington DC. Details TBA. January 24th: The National Press Club, Washington DC. Jason and Ralph will speak about Chasing Aphrodite, the press and transparency at American museums with former Getty antiquities curator Arthur Houghton and Walters Museum director Gary Vikan. Our moderator will be James Grimaldi, investigative reporter at the Washington Post. Q&A, book signing and reception to follow. February 10th, 2012: Google HQ, Mountainview CA. Jason will talk about Chasing Aphrodite and how crowd-sourcing might be harnessed to fight the illicit antiquities trade at the Googleplex, Google’s Mountainview headquarters. Details: Open to the public. 12- 1pm @ 1600 Amphitheatre Parkway in Mountain View, CA. February 15, 2012: UCLA. Details TBA. You can find updates at our events page here. Our past events include: The Jonathan Club; Chapman University; Central Michigan University; The Walters Art Museum; UPenn Law School; UPenn Museum; The Harvard Club of New York City; The National Arts Club; Princeton University; Villanova Law School; Rutgers University; New York University; Cardozo Law School; Archaeological Institute of America’s New York Chapter; SAFE; The Benson Family Farm; Elliot Bay Bookstore in Seattle; Powell’s Book in Portland; The Commonwealth Club of San Francisco; Loyola Law School; Barnes and Noble of Thousand Oaks; Book Soup on Hollywood Blvd. ; The LA Festival of Books. To suggest an event near you, please contact us: ChasingAphrodite@gmail.com.